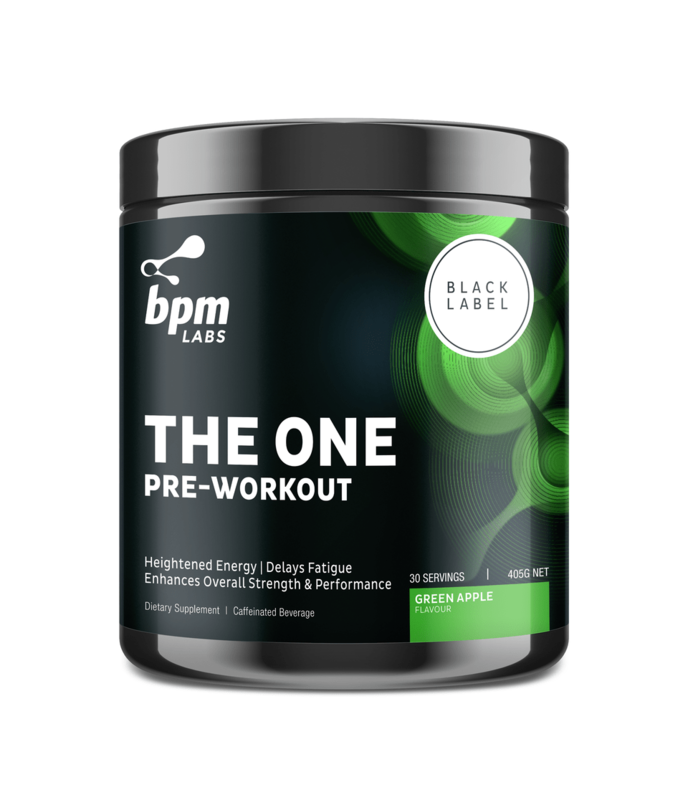 BPM Labs The One Black Label is an intense mix designed to give you the following advantages. Everyone is saying the Watermelon flavour has a fantastic taste. You must give this a try today. The Black Label range is something we wanted to bring to the market due to the popular demand expressed by the consumers and shown by our market research. 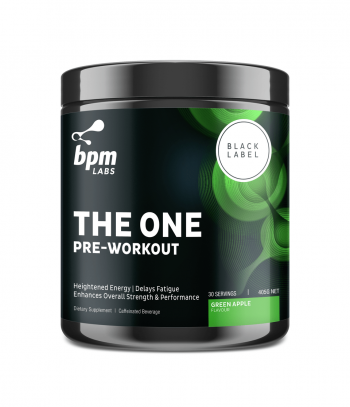 And BPM Labs The One Black Label is a blend we wanted gym-goers to be raving about. As it is as strong as promised one has to remember these are not products for the faint-hearted or ‘I’m scared of stims’ market. These are for seasoned athletes who want to break personal bests, and so they are tailored to serve the needs of the high-end user market. The main difference between the original versions and the BLACK LABEL is that the latter comes with Pouchong Tea Extract. This extract delivers a kick whereas the current BPM Labs Annihilate and BPM Labs One 2.0 range contains Eria Jarensis, the ingredient that provides you with a subtle, euphoric feeling. As mentioned in the bullet points at the top of the page, you will feel the benefits of The One Pre Workout. The One BLACK LABEL – Stronger than ever! Black Label ‘One’ is stronger than the original 2.0 with a higher concentration of Pouchong Tea Extract. Targeted for the experienced user wanting a stronger kick and mental focus. With an intense energy boost, Black Label will help you to maintain maximum strength and endurance with increased vasodilation for greater muscle pumps. The One BLACK LABEL delivers the high performance, energy, and muscle stamina that you will need to hit new PB in the gym. Without properly balanced ingredients, health supplements might as well be useless. That’s why The One BLACK LABEL was created by scientists and fitness experts at BPM Labs. We can’t stress enough that BPM Labs is a scientific evidence-based laboratory that specialises in fitness and health supplements that can (and will) take your workout to the next level. The One BLACK LABEL by BPM Labs is not a supplement for the weak-hearted. It is an intense pre-workout supplement that combines potent and powerful ingredients to increase your muscle endurance, strength, flexibility and mass. The One BLACK LABEL will help you stay focused throughout your workout. Many of the ingredients in this product will cause vasodilation that will increase the oxygen consumption of your muscles and deliver key nutrients to all of your muscles and connective tissues. Enhance the performance in muscular endurance meaning you can lift a load for a longer time under tension. 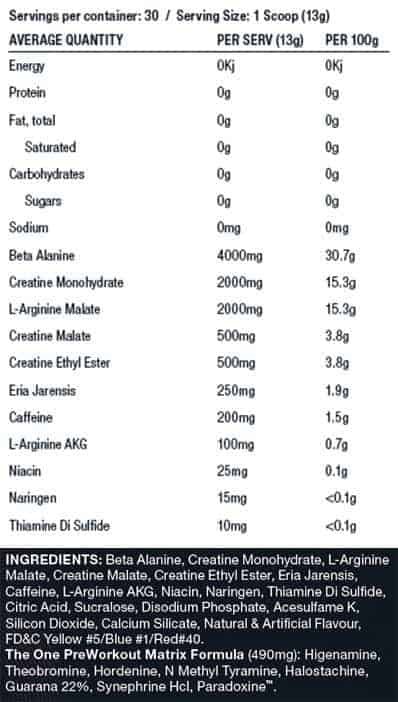 Creatine Monohydrate is a supplement that can rapidly increase the production of (ATP). This is the bodies energy system providing higher output in strength. You will notice creatine also increases unicellular water volume, which is the uptake of water that you hold in your muscle fibres. Creatine Ethyl Ester is a form of creatine that is found throughout your body. It helps supply vital nutrients to your muscles as you work out, and in turn, can help increase your muscle endurance and strength. Over time, this ingredient also causes you to retain less water. Improve the blood flow throughout your body. This helps to deliver oxygen to all of your muscles and tissues. Gain muscle mass and energy. From this, your muscles will be able to get adequate nutrition and oxygen. This can help you increase your muscle strength and endurance. Provide laser-like focus and energy and increase fat mobilisation and prevents storage. Focus and increase energy and also suppresses appetite. Ingredients to help block the receptors in your body that make you tired. This way you can stay focused throughout your workout. Reduce any inflammation in your body, and keeps your joints and muscles flexible and mobile. This ingredient will bathe your muscles in nutrients and keep them strong and healthy throughout your workout. Decrease fatigue, increase focus, increase mood, energy and reaction time without the adverse effects such as anxiety associated with some stimulants.